“I would like to commend you on the excellent performances during our holiday party. We heard nothing but great reviews on how wonderful it was for everyone!" Fabulous Face Painting By A Touch of Magic, Inc.
Make your next event unforgettable…contact A Touch of Magic Entertainment today! How Do You Spot a Professional Face Painter? My company provides a lot of services, but for today’s post, I’m wearing my “Professional Face Painter” hat. I would like to share an experience I had which I hope will help you to become an educated consumer when it comes to Face Painting. I was at an event not too long ago, where we were hired to create amazing and fast balloon sculptures (for a b’jillion people). Across the park from us was a tent with 4 “Professional Face Painters“. Yes… I’m putting the title in quotes, because this experience made me realize just how loosely that title is applied. I invited our client to consider bundling her entertainment and letting us provide both the balloons and face painting, but it all came down to money, and she had saved a LOT by going with this other company. Or did she? In the Twin Cities, we have a really strong community of amazing Professional artists and entertainers. Our common goal is to operate our businesses with integrity, wholesome values, exceptional artistry and strong business acumen. Most of us know each other, and we work together to keep standards high in this industry. Yes, technically, we’re competing for the same gigs, however, when I lose an event to another quality entertainment company, I am genuinely pleased, because I know that the customer will have a great experience, and that increases opportunities for all of us. There are also some vendors in our area who, for one reason or another, cannot compete with quality, so they compete with price. We have a free market economy, so this business model works, but it always leaves me wondering if people understand what they are getting (or giving up) when they save “a LOT”. The first thing I noticed at this event, while I was twisting balloons and engaging the children, was how many kids complained that their faces itched. Moms & Dads alike responded with “just let it dry”, or “that’s just the face paint” or “that’s because (and fill in the blank with some excuse…)” *IMPORTANT*… An itchy face is NOT a common response to face painting. It’s one thing to have an itch or a tickle in response to having the product on your skin. But a chronic itch is an indication that something is wrong! Besides the itchiness, I could see that some of the face paint was peeling off. *IMPORTANT*… Quality face paint doesn’t peel. Hobby products (such as acrylic and tempera paints) peel! 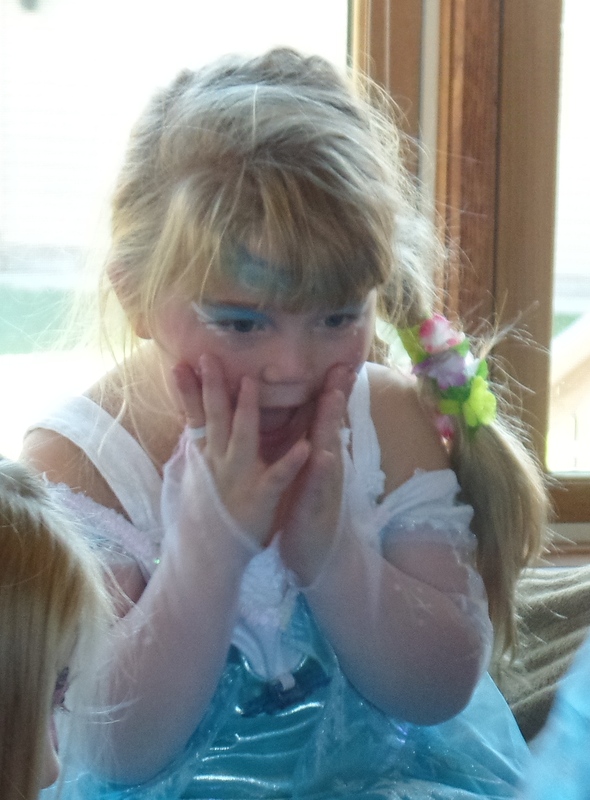 Professional Face Painting by A Touch of Magic Entertainment produces that WOW factor when children look in the mirror! Most of the Professional Face Painters I know (myself included) only use products which are FDA compliant, Cosmetic Grade, Hypo-allergenic, Professional Face Paints! Basically, what we’re using is heavily pigmented Make-up. (Face Paint is really a misnomer.) We don’t buy our face painting supplies at local art and hobby stores. Itchy skin aside, I also noticed how long the face painting line was. Balloons and Face Painting are equally popular, so we also had a lot of patrons, but no one waited longer than 10 minutes for us. I was surprised at how many adults we had in our line, until I realized that they were employing the technique of “divide and conquer”, by having one parent wait for face painting with the child, and sending the other parent to wait for balloons. I had one parent wait in my line 3 times for her 3 children. (She thought it only fair). And then she came back about 45 minutes later with her finally-face-painted kids to have them say thank you. Apparently it was taking about 8-10 minutes per child, and even with 4 artists, that meant not only a long line, but a slow-moving line. Finally, I did happen to notice that the artistry itself was sloppy and inconsistent. I’m not trying to be harsh or critical, but my client paid for this entertainment and expected a quality outcome. These weren’t folks who volunteer to Face Paint at the school carnival…these individuals were hired as Professionals. Because I believe in community (and having a healthy market), when my shift ended, I introduced myself to the other artists in the spirit of goodwill and fellowship. They were from a company I’d never heard of before. We were all very friendly, and we commiserated on how crowded the event was. And like all good Minnesotans, we discussed the weather. I asked about their paint, and one of the artists jumped in and said, “It’s non-toxic”. (*IMPORTANT SIDE NOTE*… “Non-toxic” does not mean it’s safe for skin. A jalapeño pepper is also “non-toxic”, but I wouldn’t rub it on my children’s faces!) :o) (FYI… last Spring, the New Mexico State Fair shut down one of its Face Painting booths, once it realized that acrylic paints were being used.) The conversation shifted, and I learned that 2 of the 4 artists had only been on the job for about 2 weeks. The other two had been face painting at special events for about a year. None of them had any training. They don’t carry liability insurance. They didn’t choose their products or their designs. They just did as they were told, which brought me back to question the title, “Professional”. My client had no idea up front that, while she was saving “a LOT” of money, she had limited patronage, questionable products, inexperienced artists and no liability insurance coverage. She also didn’t know that, for the same amount of money spent, if she had used actual Professional Face Painters, she would have had fewer artists, but they would have reached more people in less time. I love what I do. I love the smiles on kids’ and parents’ faces. My goal is that all events go well, even the ones where we aren’t providing the entertainment, and I hope this story has given you, the consumer, some insights to distinguish Professional Face Painters. When you hire a face painter for your next Company Picnic, National Night Out, Community Festival, Block Party, Carnival, School Event, Church Gathering, Synagogue Get-Together or Birthday Party, please know that there is more to getting value than simply paying the lowest price! At your next event hire a Professional Face Painter! I agree, when you’re hiring a face painter, or really anybody for that matter, you do not want to immediately go for the lowest bid. As the article points out, doing that could result in hiring someone without a license or any training. Instead, you want to talk to the face paint about their experience and credentials and then discuss a reasonable price for hiring them that satisfies both parties.